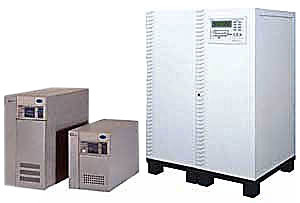 If you need an AC Frequency Converter suited for resistive, capacitive or inductive loads, the Triathlon AC converter should be your first choice. With many outstanding features, like an alarm for over voltage, this AC Frequency Converter can get the job done. Electronic Circuit / Instant Trip Breaker / Alarm for Over Voltage, Over Current, Over Temperature, Output Short Circuit Protection. HOW DO I KNOW WHICH INPUT & OUTPUT I NEED FOR A FREQUENCY CONVERTER? The number of phases (3 or one) is independent of the frequency (Hz) of the converter. Likewise, the input and output phases are independent from each other. Having said that, the larger the converter in terms of output power (KVA, kW or amps), the more likely the INPUT will be 3 phase, since this type of power is more “dense”. It is the algebraic sum of three single phases that are displace 120 degrees. Click on a model number below for specifications.